The idea to give back to the children of Brazil all began when Marcelo talked with a few friends, Lucio from the Baltimore Blast and longtime friend Marcelo 'Pavao' Moreira who was also a 1st division professional player in Brazil. They told Marcelo of the charity to help underprivileged kids and he wanted to help. Marcelo went to the families who train at the Doug Miller Family Sports Park to ask for their help. 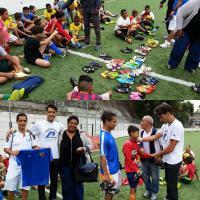 The families ended up donating 50+ pairs of cleats, all of which Marcelo was able to take with him on his recent trip to Brazil. "The smile on the kids' faces was priceless," Marcelo said. But this wasn't the first time Marcelo lent a helping hand in the Brazilian community. Growing up, Marcelo helped a lot of people by donating food to the homeless. When talking about giving back to his home community, Marcelo said that, "It makes you feel much more thankful for everything you have." This time, it was different. Instead of food, Marcelo was giving children the equipment needed to be successful in their lives. They were the same age as when Marcelo started playing soccer, as a goalie using flip-flops on his hands because he didn't have gloves, about nine years old. The cleats were horrible and some children even used their shoes to play. It meant more to him than ever to provide them with a small part that could lead to their success. In Brazil, soccer is more than just a game. "In Brazil, soccer is life. They are poor kids, so soccer may be their last opportunity to have a better future and find success in life. If they have good cleats, in a small way you are helping (them) to be successful". Marcelo hopes his next trip he can bring even more soccer equipment. The donation gives the kids a sense of hope for a brighter and successful future.